That is the book that started it all. What did it start exactly? My love affair with Kate SeRine’s Transplanted Tales series. And what is that exactly? It is the second installment and it was just as amazing as the first book. I. Can’t. Wait. For. This. Book. These books are definitely worth checking out. Along Came a Spider comes out August 1st 2013. Share the post "Along Came a Spider Cover Reveal plus giveaway"
News News – Oracle’s Moon (and the hero is) News – A Cover and a Title Demonically Tempted Cover Revealed! Loved Red. Could barely finish The Better To See You. I skimmed the last third of the book. I’m going to try Along Came a Spider; hope that its as good as Red, because if not, I’m giving up on the series. I’m all for fangirling! I want to join in. Love the covers and the blurbs and your enthusiasm. I’m all over this series — TBR pile, watch out! 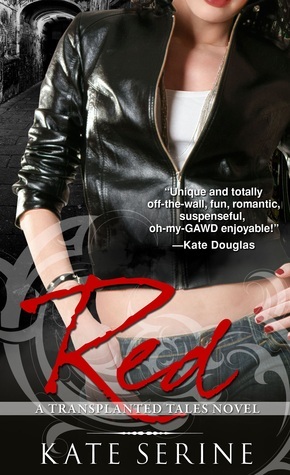 The ebook of RED is $1.99 on Amazon. BOOM! Bought it. I look forward to checking this series out! They are *both* $1.99 on amazon…bought Red…should I hold out and see if I win for The better to See You or get it on sale right now??? Don’t know if I feel lucky or not! Julie you always have the best stuff! I’ve got Red on my TBR pile. I really should start it. I keep seeing raving posts about Red this week, so I think it’s the universe’s way of telling me I should try it 🙂 Thank you for the giveaway! Kate is a new to me author; the books sound worth checking out. I would love to try the series!